Brooklyn boy John Franco grew up watching the New York Mets at old Shea Stadium, which became his home park for 14 of 21 seasons in the majors. There the pitcher entered games to the ringing chords of Chuck Berry’s “Johnny B. Goode.” Franco was good – he had to be, to play until the age of 44. One may debate the value of saves in measuring a reliever’s effectiveness, but as the 2015 season began, Franco ranked fourth on the major-league career list. He posted 424 from 1984 through 2005 – only Mariano Rivera, Trevor Hoffman, and Lee Smith had more, and Franco was number 1 among lefties. Just one other man had topped 400, Billy Wagner. Franco wasn’t a “lights-out” closer. He had a good fastball, but he was often called a “nibbler.” He made a living by getting batters to chase a changeup that was not only off the corner but dropped below the strike zone.1 He ran a lot of deep counts and put quite a few runners on base (career WHIP of 1.33). Watching him nail down a save could often be nerve-racking. Still, looking back in 2015, Franco said, “I had a real good career. I wish it could have been better at times, but I’ve got nothing to be ashamed of.” Plus, he pitched before tough crowds in New York. He remarked, “You have to have some thick skin to play here. It’s hard. Especially as a relief pitcher, you have to be able to turn the page quite a bit. Some guys could handle it, some couldn’t.”4 Franco was a fiery player but cool on the mound, and though he was small for a big-league pitcher (5-feet-10, 170 to 185 pounds), he had a bantam rooster’s strut. Jim and Mary Franco had two children, James Jr. and John. The family lived in South Brooklyn, in a project called the Marlboro Houses. This cluster of 28 buildings lies on the eastern side of Stillwell Avenue, between Avenues V and X. Stillwell Avenue marks a neighborhood boundary. Though technically the Francos lived in Gravesend, they identified more with Bensonhurst, which is known for its Italian eateries. The Catholic family worshiped at Most Precious Blood Church, on Bay 47th Street, also in Bensonhurst. Nonetheless, he also said, “Back then, it was a great time and great for baseball. One of the fields in Brooklyn is named after my father.”10 Jim Franco Field, which actually includes two diamonds, is on Avenue X in Gravesend, right across from the southern units of the Marlboro Houses. Franco also began dating his wife-to-be, Rose Morrone, while he was at Lafayette. It was right out of Saturday Night Fever: they met when John was 17 and Rose was 15, at a Brooklyn discotheque called the Night Gallery on 86th Street.15 The couple got married in 1987 and had three children, Nicole, John James (J.J.), and Ella. J.J. Franco, a second baseman, became a professional ballplayer in the Atlanta Braves organization in 2014 after attending Brown University. St. John’s lost to the University of Connecticut in the regional final, but in 1980, they won the regional and advanced to the College World Series, losing in the second round to the eventual runner-up, Hawaii. The following year, the Redmen returned to the Northeast Regional once more. The first game, against Yale at Yale Field on May 21, 1981, was the historic 1-0 duel between Viola and Ron Darling. Darling no-hit the Johnnies for 11 innings but lost in the 12th. St. John’s again made it to the regional final but lost to the University of Maine. Forgoing his senior year in college, Franco reported to Vero Beach in the Florida State League (Class A). There he posted a record of 7-4 with a 3.53 ERA in 13 games, 11 of which were starts. In 2015 Franco cited the impact of his first pitching coach, Dave Wallace. “I had so much respect for him for the way he came out there and put me in my place and told me to cut the BS. He helped me manage my emotions.”24 Wallace later became Franco’s pitching coach in the majors for two years, in 1999 and 2000. In the Dodgers organization, Franco also learned his bread-and-butter pitch: the changeup. His teacher was none other than Sandy Koufax, who was then a roving minor-league instructor.25 Because Franco was a southpaw and his change broke away from righty batters, it was often likened to a screwball. Franco remained a starter in 1982. At the beginning of the season, he was with the Dodgers’ top farm club, Albuquerque in the Pacific Coast League. However, he spent most of the year with San Antonio in the Double-A Texas League. Overall, he was 11-7 with a 5.43 ERA in 22 games. At the start of the 1983 season, Franco was again in Albuquerque, but he was shifted to the bullpen. In early May, after 11 appearances, the Dodgers traded him and pitcher Brett Wise (who never made it to the majors) to the Cincinnati Reds for infielder Rafael Landestoy. At that time, Los Angeles had an abundance of pitching. Even though Steve Howe was battling his drug problem, later that year the Dodgers traded another promising young lefty, Sid Fernandez. The Reds had a new top affiliate in 1984, Wichita. Franco made six appearances out of the bullpen there in April, but late that month he made it to the majors. Righty reliever Mike Smith, who had jumped from Double-A to the majors, was sent back down.28 Franco did not ever return to the minors except for injury-rehab assignments in 1999 and 2003. Though Power was still with Cincinnati, he struggled in 1986, and Franco received most of the team’s save opportunities. He was named to the All-Star team that year for the first of four times (the others were 1987, 1989, and 1990). In 1988 he reached a career high with 39 saves, on his way to winning the Rolaids Relief Man Award in the National League for the first of two times. The Mets were still a contender that year, finishing second in the National League East, but six straight losing seasons followed. Franco battled injury in 1992, when he missed all of July and September with an inflamed elbow that eventually required surgery to clean up all kinds of debris. “Scar tissue, dead tissue, off-color tissue,” he said. “They asked me right there how I could have pitched.”39 The elbow became tender again in mid-April 1993, and he returned to the disabled list for nearly a month. A strained right rib cage cost Franco almost all of August, and his saves sank to 10 (which also reflected the team’s low win total of 59). After his down year in ’93, Franco posted good marks from 1994 through 1996. He led the NL in saves with 30 in 1994. In 1997 New York became respectable again under manager Bobby Valentine, who had taken over for Dallas Green late the previous year. 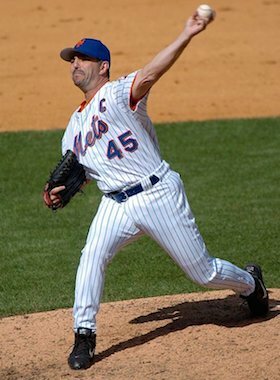 The bullpen became a particular strength of the club, especially after the acquisitions of setup men Turk Wendell (in August 1997) and Dennis Cook (in December 1997). Another deal, for hulking Dominican flamethrower Armando Benitez in December 1998, fortified the pen still further. In July 1999 injury forced Franco out of his role as closer. He strained the flexor tendon on the middle finger of his pitching hand and was out for two months, from early July through early September. Meanwhile, Benitez took over, and he remained the closer even after Franco returned. Yet even though Franco could have considered going somewhere else to get the bulk of the save opportunities, he stayed and took Benitez under his wing. Franco made it to the postseason for the first time in his career in 1999. In the NL Division Series against Arizona, he was the winning pitcher in the decisive Game Four, which ended on Todd Pratt’s dramatic 10th-inning homer. He pitched in three more games in the NL Championship Series against Atlanta, and regards Game Six as his biggest disappointment. “We were down big but came back and lost late. I was setting up for Armando [Benitez] and I gave up the lead in the eighth inning. Then we got the lead again and Armando gave up the lead.”40 The Mets eventually lost the game in the 11th inning and were unable to extend the series to a seventh game. The first ended Game Two in San Francisco, with Franco picking up the save in the 10th inning. He came on for Benitez with none out, a runner on first and just a one-run lead. After a sacrifice and a fielder’s choice, the count went full to Bonds; then Franco slipped a changeup in on the hands and past the fearsome slugger.42 The second ended the top of the ninth inning of Game Three at Shea Stadium; the Mets won on Benny Agbayani’s 13th-inning homer. In the Subway Series against the New York Yankees, Franco got the Mets’ only win. It came in Game Three, on another big hit by Agbayani. That year, Franco also received the Lou Gehrig Memorial Award, presented to a player who demonstrates his character and integrity both on and off the field. “He helped us get through a very difficult time,” said Sal Cassano, who was New York City fire commissioner from 2010 through 2014. “It hit home because his uncle was a firefighter, and his dad worked for the city. He did so much, bringing players to meet with kids who’d lost their parents.”48 Yet Franco’s work on behalf of charity and his community was ongoing well before and after 9/11. In December 2001 Franco had surgery on his pitching elbow to remove a calcium deposit. He hoped to be ready for Opening Day 2002 but suffered a series of setbacks. Finally, in May an MRI revealed that he needed Tommy John surgery, and so he missed the rest of the season.49 Despite his age, he remarked, “I had to come back from that. I didn’t want to go out on an injury.”50 He made it back to the majors at the end of May 2003 and appeared in 38 games for New York that season. The last of his 424 saves came on August 24. Franco pitched in 1,119 major-league games, which at that time was second on the lifetime list behind Jesse Orosco. As of 2015, he still ranked third in this category; only Mike Stanton had passed him. He won 90 and lost 87 in the majors, with a lifetime ERA of 2.89. Though he relied on deception, he still struck out 7.0 batters per nine innings. And by keeping the ball down, he seldom yielded home runs – just one every 15 innings. After retirement, Franco remained heavily involved with youth baseball in New York City, as he had during his playing days. He was pitching coach for the Italian team in the first World Baseball Classic in 2006. He served as an ambassador and guest instructor for the Mets, and did some TV and radio work for the team too. Previously, however, Franco had become a member of the St. John’s University Athletics Hall of Fame in 1998. The National Italian American Sports Hall of Fame honored him in 2008, and the Mets inducted him into their Hall of Fame in 2012. Even if he is never recognized as one of the major leagues’ greatest ever, John Franco’s guts, tenacity, scrappy spirit, and heart make him synonymous with New York City and the way the game is played there. 1 Tim McCarver with Danny Peary, Baseball for Brain Surgeons and Other Fans (New York: Villard Books: 1998), 99. 2 There were 26 men who entered the 2015 season with 300 or more saves, and their overall conversion rate was 83 percent. The overall conversion rate for the top 50 save compilers was 82 percent; Joe Nathan and Mariano Rivera (89 percent) are at the top, with Sparky Lyle (71 percent) at the bottom. True, the usage of relievers has changed. Blown saves were more common when bullpen aces were “firemen” who tended to enter tougher situations and/or go more than one inning. This lowered the conversion rates of Hall of Fame relievers Rich Gossage (73 percent), Bruce Sutter (75 percent), Rollie Fingers (76 percent), and Hoyt Wilhelm (77 percent), as well as Lyle. Note: Blown saves have been officially tabulated only since 1988; the statistic has since been retroactively calculated. Vin Getz, “MLB: Relief Pitchers with the Most Career Blown Saves,” Sports List of the Day, May 30, 2013 (http://sportslistoftheday.com/2013/05/30/mlb-relief-pitchers-with-the-mo...). 3 Mark Kriegel, “Johnny Wins One for Dad,” New York Daily News, October 10, 1999. 4 Paul Williams, “Thick Skin, Big Heart,” Living in Staten Island, March 17, 2015. 5 Rafael Hermoso, “Childhood Dreams Become a Reality,” New York Times, October 19, 2000. 6 Lisa Olson, “Franco finally gets chance to live his dream, and dad’s,” New York Daily News, October 21, 2000. 7 Hal McCoy, “A Special Dedication,” The Sporting News, March 10, 1986, 41. 8 Hank Hersch, “A Hometown Hero,” Sports Illustrated, May 15, 1989. 9 Bill Farrell, “A Grand Day for Franco: City Hall Honoring Pitcher,” New York Daily News, April 27, 1999. 14 Michael Mayo, “Let the Madness Begin,” Orlando Sun-Sentinel, October 19, 2000. 15 Hersch, “A Hometown Hero.” George Vecsey, “John Franco Savors His Home Plate,” New York Times, April 28, 1999. 17 Joseph Durso, “Viola and Franco Glad to Be Home,” New York Times, April 2, 1990. 18 Ronald Blum, “For Franco, Talking With His Son Was the Toughest Part,” Associated Press, May 10, 2002. 20 John Harper, “John Franco: From St. John’s to the NY Mets’ Hall of Fame, Reliever Is a City Legend,” New York Daily News, June 3, 2012. Viola embellished his story by saying that Franco threw a no-hitter. Had that happened, Franco himself would surely have mentioned it in Durso’s 1990 article, and there is no other evidence to support it. 22 George Vecsey, “St. John’s Bats Hot Despite Spring Chill,” New York Times, May 13, 1981. 23 Andrew Paul Mele, “The Elysian Fields of Brooklyn: The Parade Ground,” Baseball Research Journal, Society for American Baseball Research, Fall 2012. 26 Eric Pooley, “Using Their Heads and Arms, Frankie and Johnny Try to Pitch the Mets to a Championship,” New York, September 10, 1990. 28 Earl Lawson, “Shuttle System Now Stops at Wichita,” The Sporting News, May 7, 1984: 24. 31 Jim Donaghy, “The Franco trade hard to understand,” Associated Press, December 7, 1989. 35 John Erardi and Joel Luckhaupt, The Wire-to-Wire Reds (Cincinnati: Clerisy Press, 2010), 32. 36 Erardi and Luckhaupt, The Wire-to-Wire Reds, 33. 39 Joe Sexton, “Franco Hopes Patience Makes Perfect,” New York Times, March 5, 1993. 42 Harvey Araton, “One More Time, Franco Is a Closer,” New York Times, October 7, 2000. 43 “Perez, Reed Lift Mets,” Associated Press, May 5, 2001. 44 John Harper, “Franco: Fred Fired Bobby,” New York Daily News, November 27, 2002. 46 Paul Meyer, “Pirates Get Prepared for Games,” Pittsburgh Post-Gazette, September 13, 2001, C-4. “Teams Hold Unusual Practice Sessions,” Associated Press, September 16, 2001. 47 Ben Walker, “Flags, Tributes and Tears as Baseball Resumes,” Associated Press, September 18, 2001. 49 David Lennon, “Will This Be It for Franco?” Newsday, May 8, 2002. 51 “Astros Sign Franco to One-Year Contract,” Associated Press, January 24, 2005. 52 “Astros Take 44-year-old Franco off 40-Man Roster,” Associated Press, July 2, 2005. 55 For an argument in favor of Franco’s enshrinement, see “The Travesty of John Franco” (http://mysteriouslights.blogspot.com/2011/01/travesty-of-john-franco.html).